The student productivity paradox: Technology mediated learning in schools. This is the author's version of a work that was accepted for publication in the Communications of the ACM. Editorial and formatting changes may have been made to this version since it was submitted for publication. The final version of the article is available through licensed access provided by the publisher. Published in Communications of the ACM, 51(9), 128-131. doi: 10.1145/1378727.1389974. 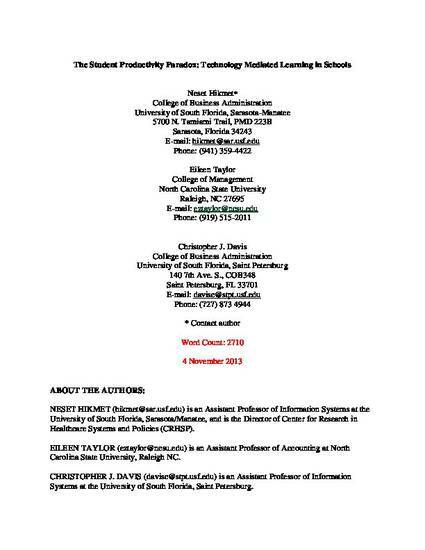 Members of the USF System may access the full-text of the article through the authenticated link. Hikmet, N., Taylor, E.Z. & Davis, C.J. (2008). The student productivity paradox: Technology mediated learning in schools. Communications of the ACM, 51(9), 128-131. doi: 10.1145/1378727.1389974.